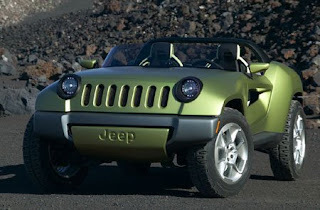 The Jeep Renegade which was first shown at the 2008 Detroit Auto Show and which I failed to report about, was seen at the Auto China 2008. This cool looking car is an electric car powered by two lithium ion batteries which is located at each axle to create a 4x4 feel. According to Chrysler, the Jeep Renegade can go from 0-60 mph at 8.5 seconds. Not exactly fast but nevertheless, this is one cool car.